Rowan Atkinson throws Mr. Bean, James Bond and Inspector Clouseau in a blender to create Johnny English, a secret agent comedy with extremely familiar ingredients but mixed in the right proportions. Incompetent British secret service agent Johnny English (Atkinson) is inadvertently responsible for the death of England's top spy, Agent One. English then flubs his security assignment at Agent One's funeral, allowing a bomb to kill most of MI7's other top spies. As one of the few surviving agents, English is pressed into field service to investigate a plot to steal the Crown Jewels. English teams up with Agent Blough (Ben Miller) to investigate flamboyant French prison magnate Pascal Sauvage (John Malkovich), who appears to have a nefarious plan to take control of England. Interpol Agent Lorna Campbell (Natalie Imbruglia) eventually joins forces with English and Blough as they race between England and France to stop Sauvage having himself appointed King and turning all of England into a prison. Almost every set-piece scene in Johnny English is derived from another movie. The car chase, the cocktail party, the high-rise break-in, and the mansion infiltration are basic components of the genre, and director Peter Howitt lines them up and methodically checks them off, often with just enough of a funny twist to maintain the comic momentum. With three screenwriters sharing the credit, hard work went into punching up the script, but it still defaults to exactly what can be expected if Mr. Bean takes a run at James Bond. 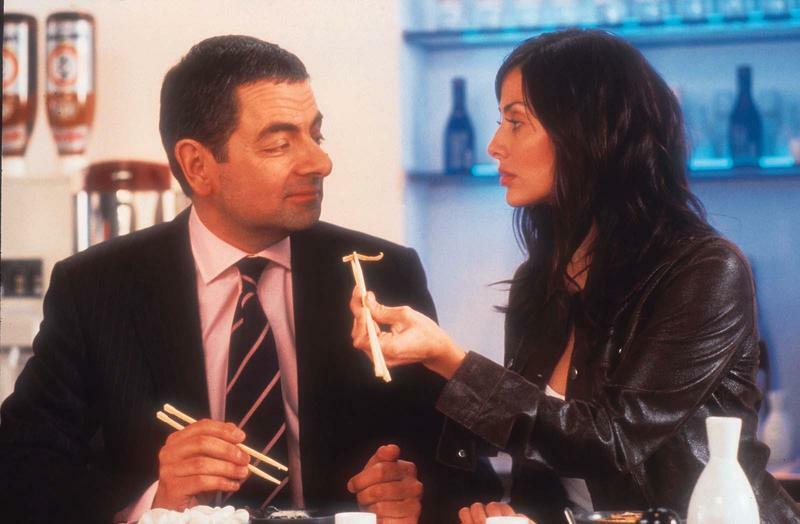 Satirizing a series that rarely takes itself seriously is a risky business, but Atkinson makes the better moments of Johnny English work well, milking his ability to fake authority and project unconvincing confidence for all its worth, as he falls into every possible car-sized pothole on his way to becoming a national hero. Ben Miller gets the dubious privilege of playing the straight man to English's bumbling fool, and Natalie Imbruglia does her best impression of Barbara Bach in The Spy Who Loved Me as the exotic agent who teams up with English. John Malkovich enjoys the compounded pleasure of letting loose with bucketfuls of villainy while portraying the French as the slimiest enemies of England in a performance that is all hair and dismissive European uppityness. What Johnny English lacks in originality it makes up for in well-intentioned laughs and sharp delivery. English never figures out how to fire his handgun, but he nevertheless hits most of the intended targets.